Each year, the week of Thanksgiving, George and I put our Christmas tree up as our favorite Christmas movies play in the background. This year the quads were too small to help, so we worked under the cover of darkness. The next day, they had a special screening of Baby Einstein’s Baby Santas, however. I imagine Christmas tree decorating as being a fun family activity for years to come, especially when our “kid tree” fills with more family creations and treasures. My mom found this beautiful wide mesh ribbon for our tree and mantle. It did such a lovely job of filling our tree. In fact, we used about 50% fewer ornaments than usual (nice time saver around here!). We typically decorate our mantle with garland laced in shimmery ribbon and white lights. However, we knew that would be a danger this year. 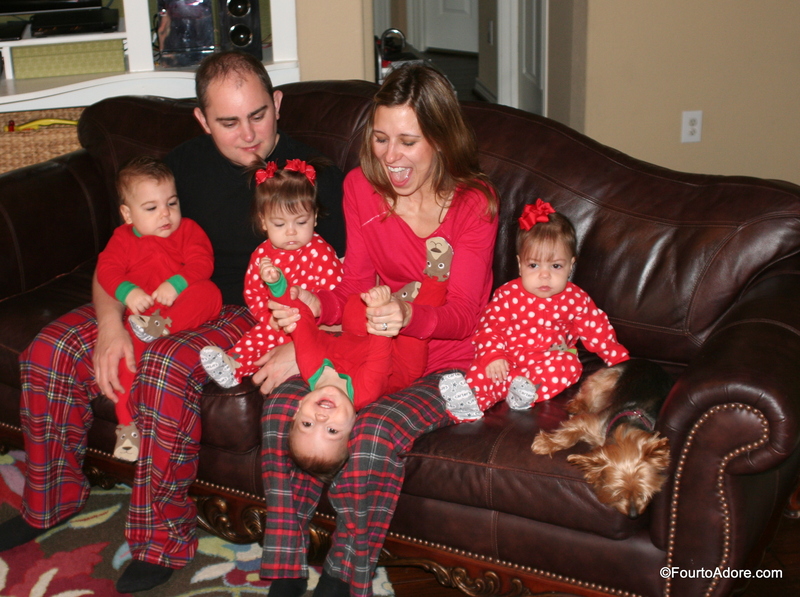 Eight little hands would undoubtedly unplug the lights and yank the garland. George and I spent the last year debating about how to enjoy a Christmas tree in the den, while keeping it safe for toddlers. We ended up placing it atop our round coffee table so it’s too high for them to tip. What’s really neat is that I remember my grandmother putting her tree on this same table so actually it’s an old family tradition. 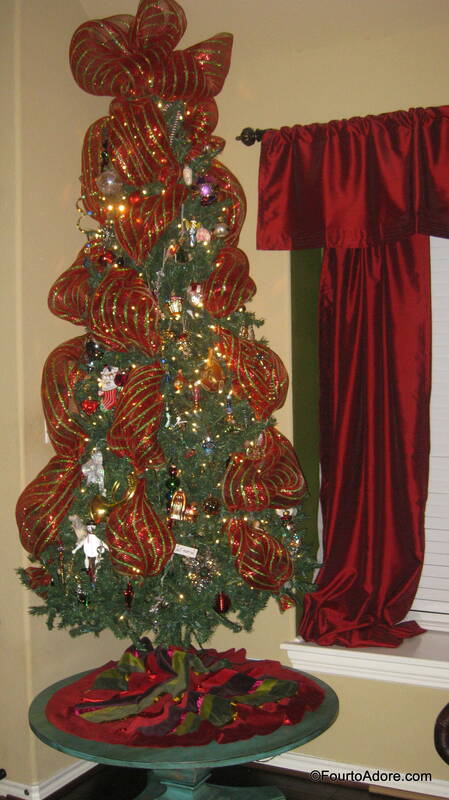 The lowest branches are void of ornaments and all other low hanging ornaments are plastic, shatter proof, and hook free. Each of the quads has grasped a branch and grabbed a few ornaments, but they really don’t bother it much especially as the novelty wears away. I never would have imagined having this many stockings adorning our mantle, but it’s a beautiful sight. One bitter cold evening this week, George bravely built a fire and the quads obediently stayed away from the “hot”. They all know the baby sign for “hot” and heed our warnings. In order to hang so many stockings, and “quad proof” them, we used a curtain rod and three industrial clamps. The quads have done well with using their eyes to see and not touching, but the rod is really strong if they ever pull one. Once our den is transformed into a cozy Christmas scape, it’s time for cookies and popcorn. The first Christmas we spent in our house, our neighbors generously delivered the most delicious sugar cookies we ever tasted. At first they taunted us saying it was a “secret family recipe”, but in time they shared it with us and it’s now a family favorite here. I think the secret to this recipe is the heavy cream, it adds a nice richness to the flavor and it softens the texture. 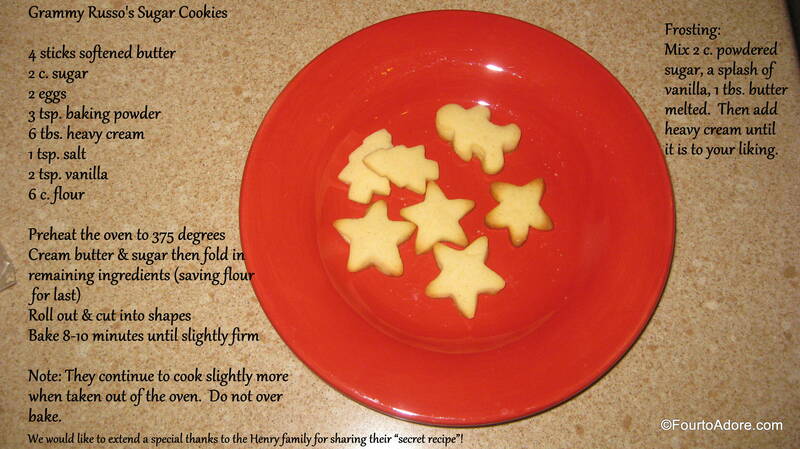 This recipe yields four dozen, but I took my sweet time snapping a picture of them, and only six mini cookies remained three days after we baked them. Also, the frosting never made it onto this batch of cookies because they were devoured too soon! As a child, my grandmother mailed us an Advent calendar filled with chocolates, marking down the days until Christmas Day. I remember anxiously waiting for its arrival, and then trying to figure out whether my sister or I would get to eat the first morsel (each day had one chocolate inside so we took turns). Chocolate filled Advent calendars are rare these days, but every now and then I spy one while shopping and remember the joy they brought to our family long ago. 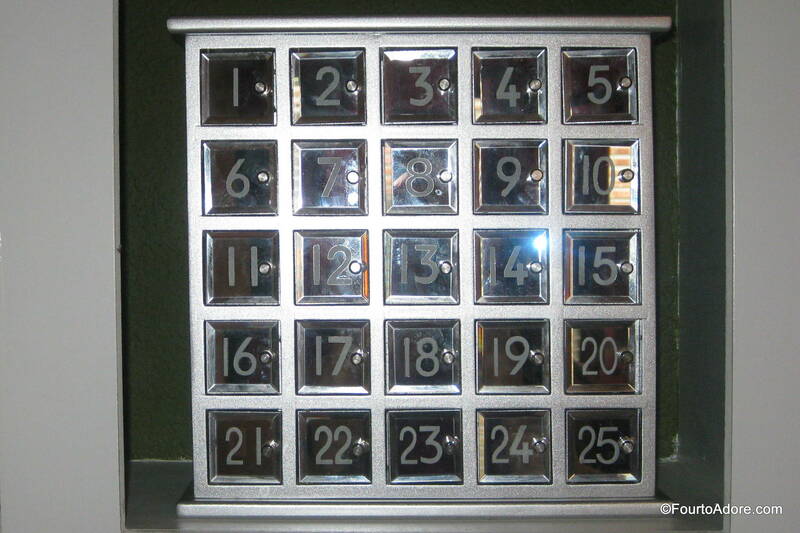 Several years ago, I found a beautiful mirrored Advent calendar at Target. It has large openings covered with miniature doors for each day. Prior to having our own children, George and I filled it for each other. Sometimes we put little chocolates inside, and sometimes little notes to each other. This year, we filled it with M & M’s for the quads to enjoy. As they get older and better understand the concept, we will probably add small gifts or notes to the boxes. This year was our first year to adopt an Elf on the Shelf. While the tradition has become extremely popular in the last few years, George wanted to partake in that tradition long before we even had thoughts of children on our minds. We met our first Elf on the Shelf at my cousin’s house. We noticed him dangling from their chandelier as we enjoyed dinner together. She explained that it was their family’s Elf sent from Santa to monitor the children’s behavior and report back to Santa. Every Christmas thereafter, George would mention adopting an Elf on the Shelf, and this year was prime time for it. 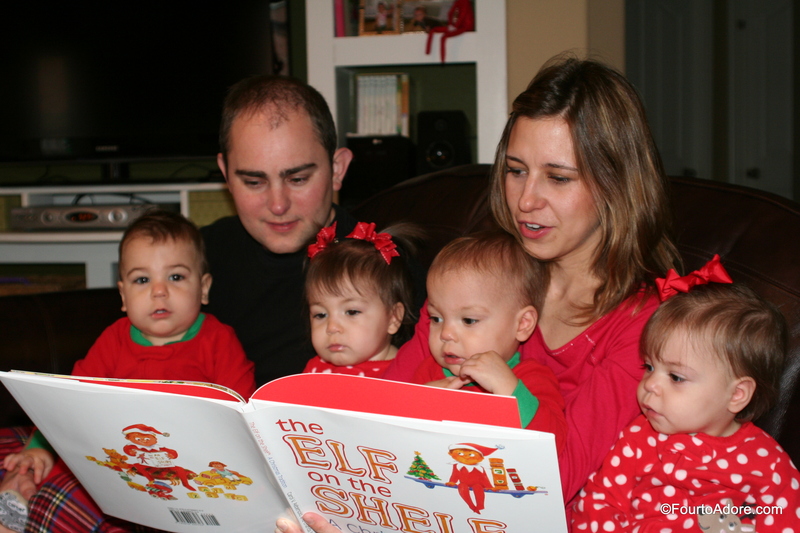 Since adopting our Elf, we read the story to the quads and Rylin named him, “Bop”, which they all say. Although the Elf on the Shelf isn’t supposed to report to your home until December 1st, ours arrived a little early and has been keeping the quads in check. Every morning we ask them were Bop is and they set out looking. He stays in plain sight so it doesn’t usually take them long to spot him and begin pointing ferociously at him. 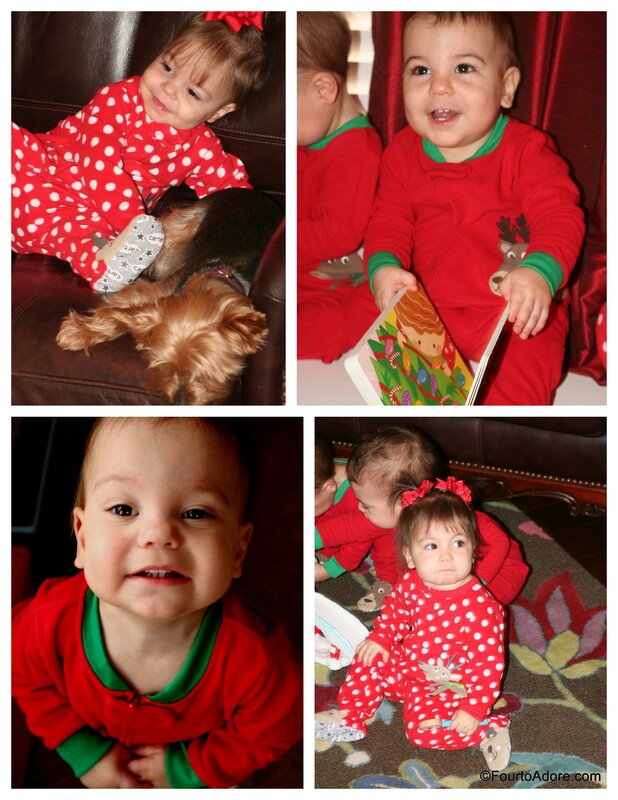 Last year, when Santa stopped by for a surprise visit, I HAD to make sure the babies were dressed in cozy Christmas pajamas so a new family tradition was born. I found these a little early, and have been dressing the quads in them a few weeks already to get as much wear as possible. 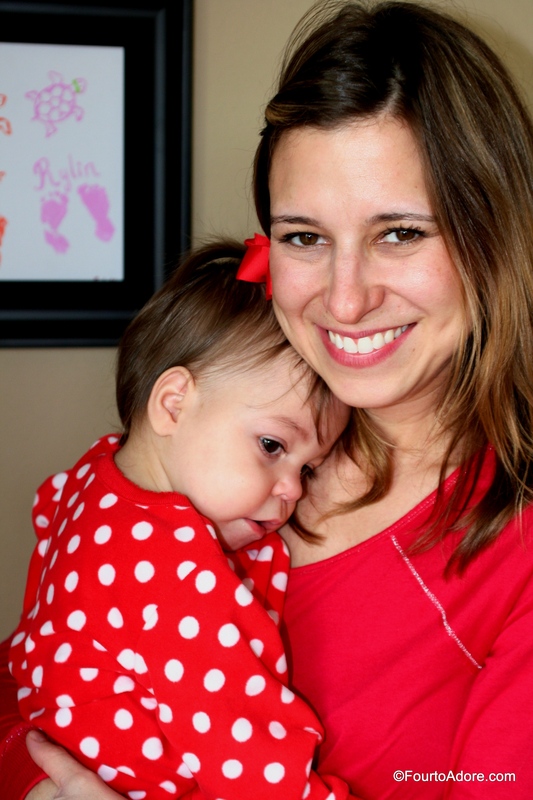 If they don’t outgrow them, they may wear them until Valentine’s Day! Sydney is the best snuggle bunny! I sometimes wish I could snuggle her all day long. Perhaps the most important Christmas tradition of all is the nativity scene. After all, it is the point of Christmas in the first place. 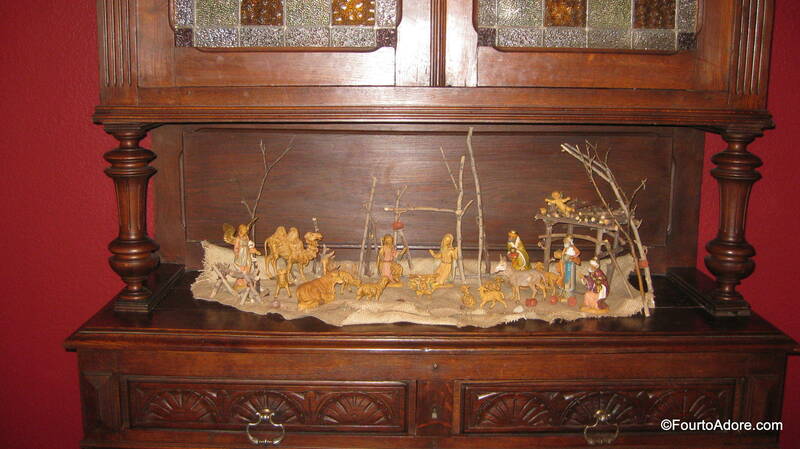 Our nativity is the same Fontanini one my family used as a child. My mother passed it down to me when I went off to college and lived in my first apartment. There is actually a really great story behind this nativity, but that’s a whole new post! 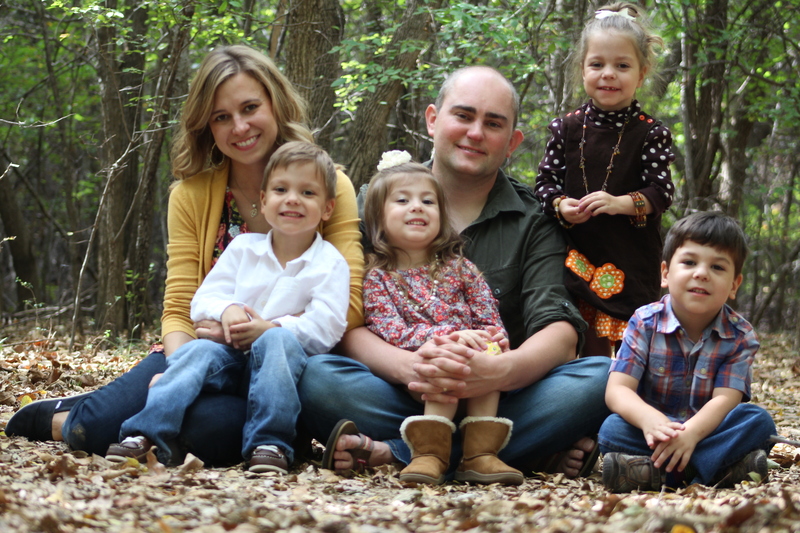 What traditions does your family hold close to it’s heart? I love it!!! What beautiful traditions!l Carry ON!!! Amber, LOVE the picture of you and Sydney snuggling! I am taking the easy way out and not doing a tree for the second year in a row, but there is not much room in the house and in the meantime, I am storing up/making ornaments that will be so fun to go through in years to come! 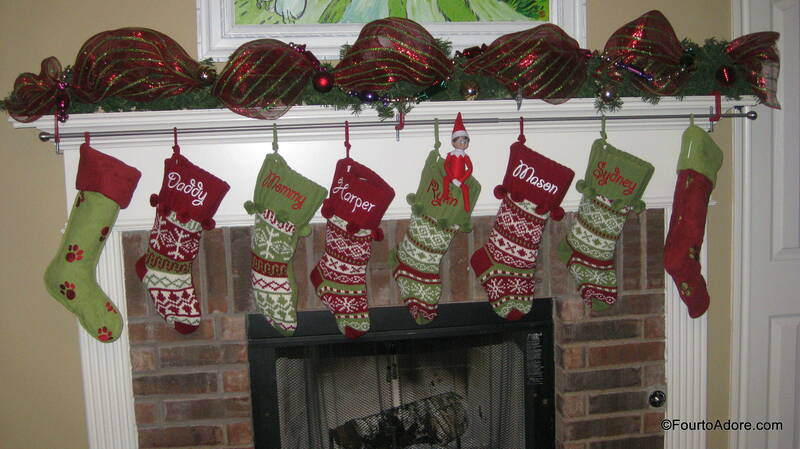 Our stockings are hung… on the entryway wall! Happy Christmas Season to You!!! I wanted to try your cookie recipe over the weekend, but I didn’t have enough flour or sugar. I added the heavy cream to a dry mix and I had already whipped up, and it did make a difference! Ahh! The heavy cream really is the secret so you got the effect I’m sure. It takes a TON of flour and sugar. I also love the Fontanini nativity set. Fisher Price has a delightful Little People nativity that children can play with. Familychristian.com has the set for a very reasonable $30. No shipping charges on a $50+ order – so perhaps you can find someone else interested in a set and order together. You can order the shepherd and sheep directily from FisherPrice.com for $15. No shipping charges on order $35+. 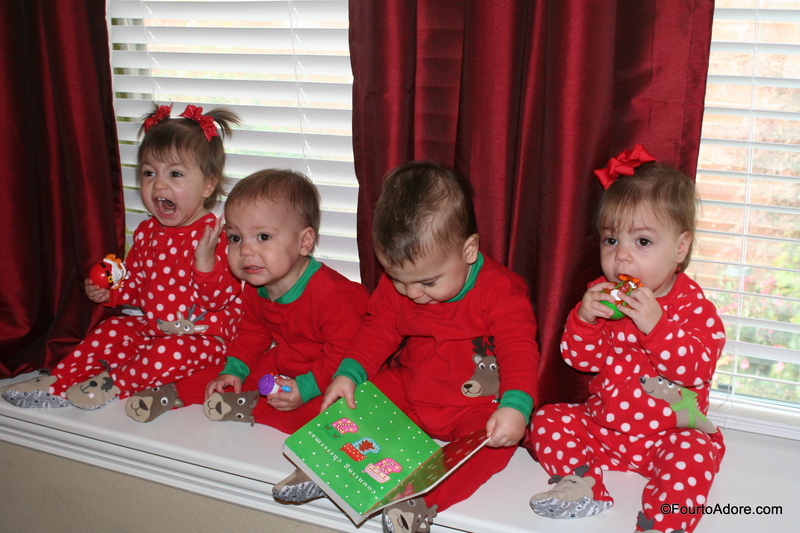 I love seeing little ones act out the Christmas story. So dear! 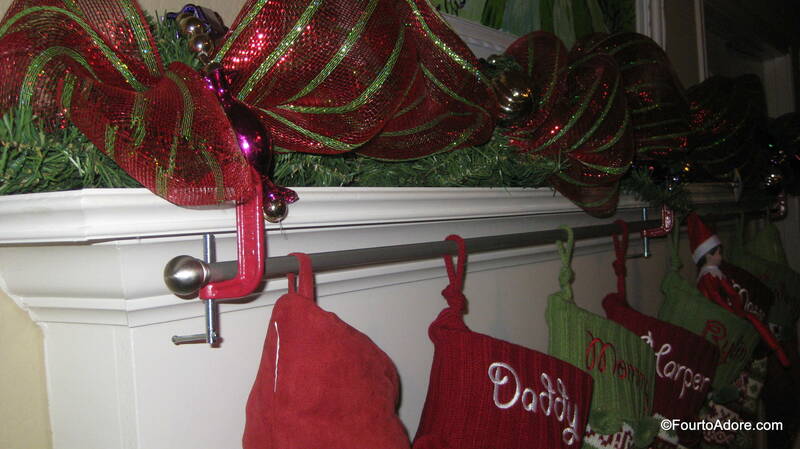 I also have 8 stockings to hang (6 kids), and I love the idea of using a curtain rod and the red industrial clamps. It’s hard to tell from your photo, though, if your rod is simply laying across it, or if you drilled holes in it and screwed the clamps through the rod. Can you clarify for me? Thanks! and Merry Christmas! We didn’t drill into the mantel at all. The clamps open wide enough to go around the curtain rod and over the edge of the mantel. Then we tighten the clamps around the mantle. We used three clamps- one on each end and the middle. – Every year we go to Hallmark and each of us picks out an ornament. Then as a family we pick a “Family Ornament” (usually a larger one with lights/music but sometimes not) Occasionally if I see one that is special to me or one of them in terms (a toy I had as a kid, or something meaningful for them or that they love) I’ll buy another 1-2. The idea with this is that when they are adults and have their own trees, they will take all of THEIR ornaments and start their own. We will keep ours and the family ornaments. We use our older tree for these, it’s the sentimental tree with these and homemade ones etc. Then in the living room we have the more “formal” tree that is coordinated etc. – We use a Fiestaware plate/mug with a Christmas tree on it for Santa cookies/milk. Each of our kids will have a different pattern of Fiestaware plate/mug to use when they have children one day. I am a Fiestaware lover and they know that and therefore they really like the idea. I have plate/mug for the oldest two, and will ultimately purchase for the younger two, and will keep them all stored away until they need them. – We usually make cinnamon rolls (dough in pan, frozen and to be thawed and baked fresh, along with homemade icing) and some candy/cookies for the neighbors. – Other than that we each have stockings with names embroidered, and hang a really pretty mistletoe ornament in the same spot in the foyer each year.